Η Jaguar συνεργάστηκε με την σχεδιάστρια μόδας Stella McCartney και παρουσιάζουν την one-off σειρά FEEL XE Experience της XE. Ο στόλος των μοναδικών αυτών XE θα μετακινούν διάφορους VIPs κατά τη διάρκεια της εβδομάδας μόδας του Παρισιού, με τις Xe να είναι ντυμένες στα χρώματα της ανοιξιάτικης συλλογής ρούχων “2015 Superhero” της McCartney. 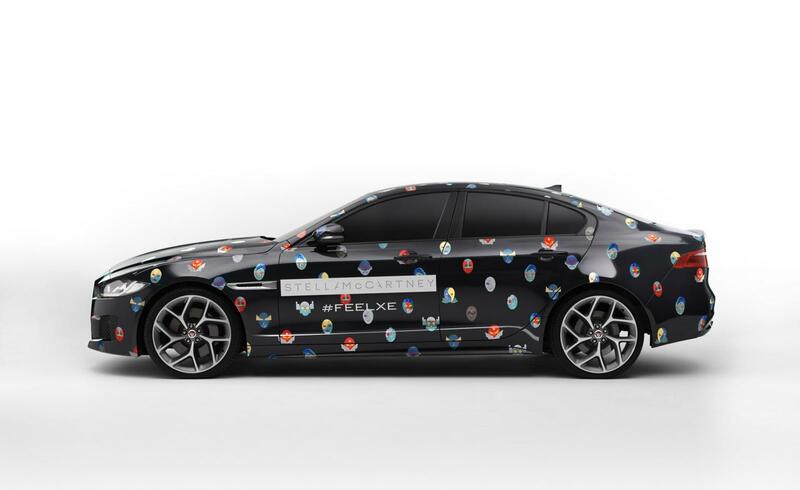 22 SEPTEMBER 2014: Ahead of Stella McCartney’s Paris Fashion Week Show on 29 September, Jaguar has joined forces with the leading British designer for the next phase of the FEEL XE campaign as the roll-out of the new Jaguar XE continues. Both Stella and Jaguar represent the best in British design and have a shared commitment to modernity, performance and innovation, and the FEEL XE Experience is an expression of this design philosophy. The FEEL XE Experience marks the next phase in the XE reveal, where Jaguar will announce full details of the entire XE range at the Paris Motor Show, from the exceptionally efficient 99g/km E-Performance model to the thrilling 250km/h supercharged S.
Together, the two prestigious British luxury brands have created the FEEL XE Experience; featuring a fleet of luxury Stella McCartney inspired Jaguars draped in her distinctive Superhero print from her Spring 2015 collection. These vehicles will be taking to the streets of Paris on Monday 29 September, delivering a series of FEEL XE Experiences that have been carefully curated by Stella and Jaguar to provide consumers with an Exhilarating taste of cultural highlights that are unique to Paris. Two years after graduating from Central St. Martins College of Art and Design, London, Stella moved to Paris and four years later she launched the first collection of Stella McCartney fashion house in Paris. The French capital remains close to her heart and it is still the city where Stella shows her new ready-to-wear collections every season. It is fitting that the streets of Paris will be the only city in the world to have the Jaguar Superheroes on its streets. The FEEL XE Experience marks the continuation of Stella’s involvement in Jaguar’s FEEL XE campaign. Stella attended the Jaguar XE global premiere at Earls Court in London on 08 September, and she also chose to arrive in the XE, the most fuel-efficient Jaguar to date, at The 2014 Stella McCartney Green Carpet Collection earlier this month.